Today’s subject is going to be a little tricky because I’m talking about my own personality type. As an INFJ, I always find it difficult to write about my own type because I feel that it can sound arrogant or self-aggrandizing. I can applaud other types without feeling like I’m patting myself on the back, but with the INFJ type, it feels weird talking about certain strengths because I feel like I’m bragging. That said, INFJs are often one of the most misunderstood personality types because they comprise only 1% of the population and are often surrounded by people who don’t quite understand their strengths or sympathize with their weaknesses. So I feel like it’s especially important to address some of the issues they face as children. INFJs as children (and as adults too) can often seem like a bundle of contradictions. On one hand, they are extremely imaginative and open-minded – on the other hand, they are stubborn and staunchly hold to their ideals. They are sensitive and greatly desire harmony, but they have no problem speaking out or defending a cause they firmly believe in – even if it ruffles a few feathers. They can go from being the shyest, most sensitive children to the most outspoken, single-minded leaders of their beliefs. Because they are a rare personality type they can often feel misunderstood and isolated as children. Many times, when they discover their personality type, INFJs feel a huge sense of relief because their whole lives they’ve felt somehow separate from everyone else. Not better than everyone else – just like they don’t quite fit in anywhere. P.S. If you want even more in-depth information on INFJs and relationships, careers, parenthood and more check out my eBook: The INFJ – Understanding the Mystic. Children up to age 13 really only master their dominant function very well. Their other functions remain relatively immature. INFJs have Introverted Intuition as their dominant function. This means that they are always trying to figure out the connections between things, and trying to understand the bigger picture. To them, life is one big puzzle and every piece fits into a larger whole and everything has meaning. They can be very serious about their theories and ideas, and can also be quite whimsical and imaginative. Many INFJs mention that as children they struggled with accepting reality for what it was. Sensors are much more aware of what is and take things at face value – while Intuitives are more apt to see what things mean and to look beyond the surface in a way that makes them a little unsteady in the physical world. INFJs may approach the physical world with a certain hesitancy, and can be a little clumsy and awkward in their physical environment because of their inferior Extraverted Sensing. INFJs can be a little obsessive about their goals or interests, and this is because Ni (Introverted Intuition) is a very singularly-focused function. Ni is intensely focused on one big idea or one main interest that connects everything else. One sure way to aggravate an INFJ child is to break into their meditative Ni-state with loud, sensory stimulation. They tend to get easily overstimulated and can become so caught up in their ideas that they are easily startled when faced with an interruption. 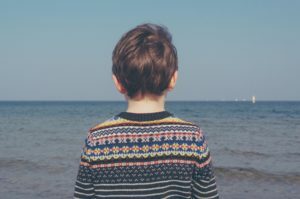 INFJ children are often repeatedly told to stop daydreaming so much, to pay attention, focus on the task at hand, and get their head out of the clouds. What many well-meaning parents don’t understand is that the natural comfort zone for an INFJ is in their own mind. If they are forced to extravert too much, to engage too often with the physical world – if they are raised spending 7 hours a day in school and then 3 hours in after-school activities – they will quickly burn out. If you look at well-known INFJs – Carl Jung, Dante Alighieri, Fyodor Dostoevsky, they often reached their best conclusions and ideas alone, deep in thought. We wouldn’t have many of these great writers and philosophers if they hadn’t been allowed to immerse themselves in their passions and thoughts fully. 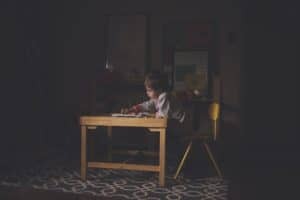 Parents of INFJs should do what they can to ensure that their children are given a good amount of alone time to think and reflect. Bonus if you give them plenty of notebooks and pencils to record their thoughts and ideas! This isn’t to say that INFJs want to sit around in the dark all day. I’m also not saying that you should just let them do whatever they want. Clearly, there are times when INFJs need to pay attention and focus on present realities – it would be unhealthy for them to not exercise that skill. You’ll find that when a young INFJ has a passion, plan or goal they are extremely proactive and productive. Dante himself said “The secret to getting things done is to act”, and INFJs are often urgently aware of the swift passage of time. Once they’ve deciphered their plan they are anxious to achieve it. Give them a chance to discover their dreams and ideas, and then they’ll likely surprise you with how productive and thorough they can be with making their goals a reality. Because INFJs have inferior Se (Extraverted Sensing) they can become easily overwhelmed with an excess of sensory stimulation. Being Ni-dominant types, they prefer the world of their mind and quiet places they can access their thoughts easily. As children if they are frequently in an environment of noise, interruptions, little privacy, etc,..they can become highly stressed. Things like a TV that is always on, frequent loud music, or even sharing a room with noisy brothers and sisters can be especially difficult for the INFJ. While they may enjoy a good movie or a good romp with their siblings, they are easily overstimulated and are extremely sensitive to the sensory world. Too much sensory stimulation can cause the young INFJ to fall ‘into the grip’ of their inferior function; extraverted sensing. When this happens, the INFJ may become uncharacteristically indulgent and rash. They may have issues with binge eating, physically harming themselves, or making extremely impulsive decisions. They will seem more like unhealthy ESTPs than INFJs when they are in the grip. INFJ children who are triggered by sensory overstimulation can become extremely unhealthy, stressed, and out of balance. It’s very important that INFJ children have a chance to be alone every day for a good period of time. Keep in mind, they also have strong feelings for others, and will enjoy one-on-one and quality time very much. I know as a child I can relate to all of these things. I was extremely aware of how everyone in my family was doing, and if I sensed that something was ‘off’ even just a little bit I would lie awake at night trying to pinpoint what it was. Sometimes I would come up with terrible conclusions and ideas about what was wrong with a certain family member. Sometimes I would feel anguish over a person we passed in the street who seemed distressed. I remember getting sick to my stomach with worry over seeing a young boy walking down the sidewalk who was smoking. He was way too young to be smoking in my mind, and I was stricken with horror and concern for him. For days I couldn’t get rid of that sick, worried feeling. I didn’t know who he was and had never seen him before. These kinds of experiences and feelings are very normal for young INFJs, and it is good for them to have a parent who takes the time to listen to their worries and address them without belittling their sometimes unrealistic concerns. Young INFJs hold very tightly to their intuition and gut feelings – and rightly so, because their intuition is their strongest function. However, as children, they’re still developing this function and it’s not perfectly balanced yet. It can kind of overtake everything else and cause the young INFJ to feel pulled along by it. Young INFJs may have gut feelings that certain situations are unsafe, and in some cases they may seem very paranoid. Many young INFJs are little conspiracy theorists – never quite sure of the world around them, never quite sure if they can trust it. For me personally, I didn’t trust elevators when I was a child for a long time. You never knew if one could go plummeting to the ground. I used to take the stairs while the rest of my family took the elevator. I was worried my eyeballs would fall out if I wasn’t careful. I was worried my family didn’t love me and that it was all pretend or an act. I would find myself worrying about certain things obsessively, but yearning to let go of the worries just as incessantly. Night time was a terrible time full of fears and dangers in my mind. I would lie under my blankets, terrified, just hoping the night would end. Having the ‘there are no monsters under your bed’ talk didn’t help. I wasn’t worried about monsters, I was worried about demons and devils, and because I grew up in a religious household those fears were quite real to me. Many INFJs report similar childhood experiences; you see, the INFJs imagination, and their certainty of their conclusions causes them to believe very firmly in their suspicions and future forecasts. They trust the physical world, their physical senses, much less than they trust their mind and their predictions. This is something that the sensor world often struggles to understand about INFJs, especially if they are parenting them. While sensors, who make up roughly 75% of the population, trust the physical world and are more concrete in their thinking, intuitives trust their mental world and their imagination more fully and can be more prone to existential worries. INFJ children are often very shy and sensitive to new people. They very much want to have a close friend or two, but usually have a hard time breaking into social settings. They are naturally very private children, but at the same time, they strongly desire to be liked. They simultaneously need a great amount of alone time and also some quality time with others that they can emotionally connect with and nurture. Yet their shyness can make it very hard for them to break out of their shell. INFJs won’t ‘go along’ with the flow very easily if they don’t believe in something or feel that it goes against their convictions. They will fight against all their desires to be liked if their beliefs are mocked or if they don’t believe something is right. This can surprise some of their friends because they are so used to the INFJ being quiet and shy and ready to please. 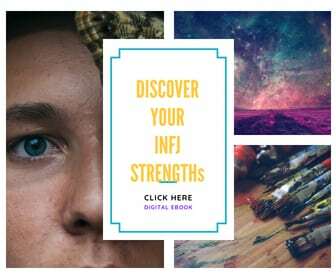 INFJs can become fiery, outspoken, and persuasive if challenged about their core beliefs and convictions – and they will stand up to literally anyone who challenges them about these convictions, no matter who they are – teacher, parent, friend, or enemy. It can seem as if they become a different person entirely if their values are challenged or threatened. INFJs are extremely perfectionistic with themselves and hold themselves to very high standards. While they can be very accepting of others, they usually have a difficult relationship with themselves. Because they have strong Extraverted Feeling, they are very aware of the moods and emotions of those around them – at the same time, they can be oblivious to their own moods and emotions and can be very overwhelmed by them. This might frustrate them to no end as they want to just move on and get things done but they feel immobilized by emotions and feelings they don’t understand. They want to succeed at everything they try and are very hard on themselves when they fail. INFJs can also get trapped in their idealism. They long for a ‘perfect’ world and want to try to make the world into their vision of what it should be. They set unattainable goals and feel crushed when they fail. If you’re a parent to an INFJ, it’s good to try to talk to them about their dreams and goals – let them know you admire their idealism, but try to think of baby steps they can take to accomplishing things. Try to help them to not get bogged down by all the pressure they put on themselves – and try to praise them for their accomplishments Verbal affirmation means a lot to young INFJs and gives them the confidence to keep going. There is a lot more I could write about INFJs, but considering this post is already 2000 words long I think I’ll give it a rest for now. I hope that if you are an INFJ that this gives some validation or makes sense of some of the struggles you had as a child. I hope that if you are the parent of a young INFJ that this gives you some insight into what they might be experiencing and going through. If you have any comments or questions please feel free to let me know! I’d love to hear from you. Want to find out more about the INFJ in childhood and beyond? 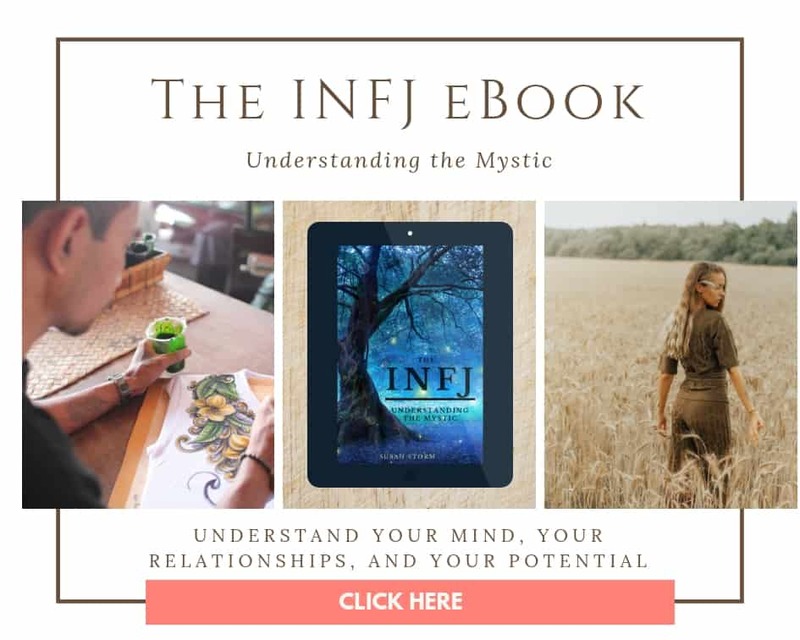 Get my new eBook The INFJ – Understanding the Mystic! 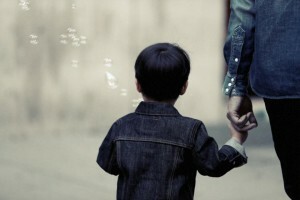 Find out more about INFJ children in 7 Things That INFJs Experience as Children. The Neuroscience of Personality by Dario Nardi, Ph.D. Loved your article. I could especially relate to feeling anguish over a stranger I would pass who seemed distressed, I would be bothered for weeks. Out of five chidren I was the only one not allowed to watch the tv show Lassie because I would cry hysterically if the dog limped or got hurt. I appreciate you sharing your childhood experiences. Oh wow! This was so me growing up. Thank you for writing this article! I’m so glad I came across this. Honestly, it brought me to tears as I was reading it. It’s such a relief to know the are other people who understand what it’s been like in my head. For the longest time I’ve just thought, and sometimes others have made me feel, that there has always been something wrong with me.